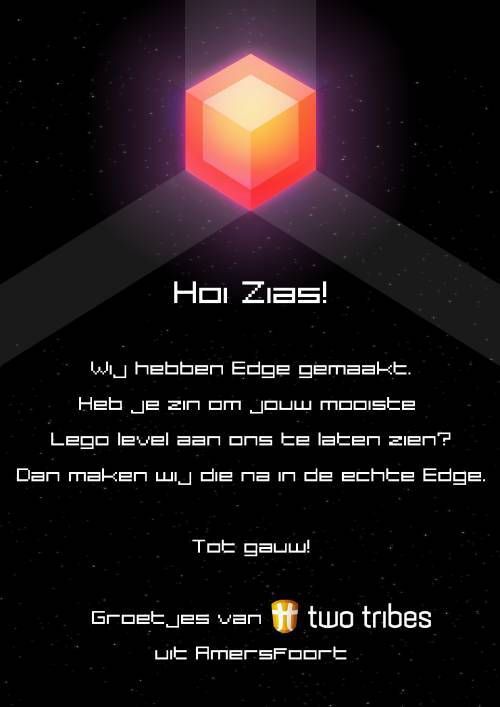 Game developer and dad Martin Kool was thrilled when his six-year-old son got so into mobile puzzler Edge that he started designing his own levels with LEGOs. When he pinged developers Two Tribes on Twitter to see if they had a poster or something for the kid&apos;s birthday, they got back to him with an amazing suggestion: they&apos;d put one of his levels in the actual game, name it after him and release it on Steam. They sent out the above letter, which reads: “Hi Zias! We made Edge. Would you like to come over and show us your coolest Lego level? We’ll then put it in the real Edge. Cheers from Two Tribes, in Amersfoort.” Martin and his dad will be heading to the developer in March to finalize the awesome gift. Head to Martin&apos;s blog to read the full post. We&apos;re guessing the kid crapped his pants out of excitement—that&apos;s what we would have done at that age. Hell, we probably still would. Did you ever receive a better present when you were little? Let us know in the comments or on Twitter.